We consult on all things medical. The value of a medical case can be greatly improved by identifying and implementing strategies to capitalize on significant medical or surgical issues. Let us help you prepare for your medical cases and facilitate case coordination from the outset. We can often optimize medical issues in just a few hours of consultation. Don’t waste time and money if the medical issues are really not significant? Dr. Gandy is an actively practicing adult/pediatric Orthopaedic Surgeon. For over 30 years, his practice has emphasized Worker’s Compensation injuries, in the care of those injuries and the evaluation of workers in the context of independent medical exams and second opinions. We provide prompt service with reports in any form requested to insure clear and concise understanding of pertinent details. Together, we will discuss what will best serve the attorney’s needs at the outset—and we’re happy to make any mid-course changes when needed. Our business model makes medical consultation affordable in almost all of your cases. We have purposefully kept our fees reasonable allowing you to consult with us without concern about budgetary issues in the case. In many cases, we can optimize your medical issues in just a few hours. Dr. Gandy has found that as he works with more and more attorneys, he has been asked to provide many medically related services. In other words, each attorney with whom he consults finds different and varied medical services for him to provide based on the unique way they approach medical issues in cases. He may be more useful to one attorney providing case coordination and to another attorney by provding up to date medical journal articles in advance of questioning a medical expert. Because he is very aware of your expenses, Dr. Gandy has made the decision to kept fees reasonable. Many attorneys use medical consultants only when confronted with problems in the case. Dr. Gandy suggests you bring him in at the outset of your representation as this approach has almost always added value to the case. Think about how he could help you to increase case value and save you time while not breaking the bank. 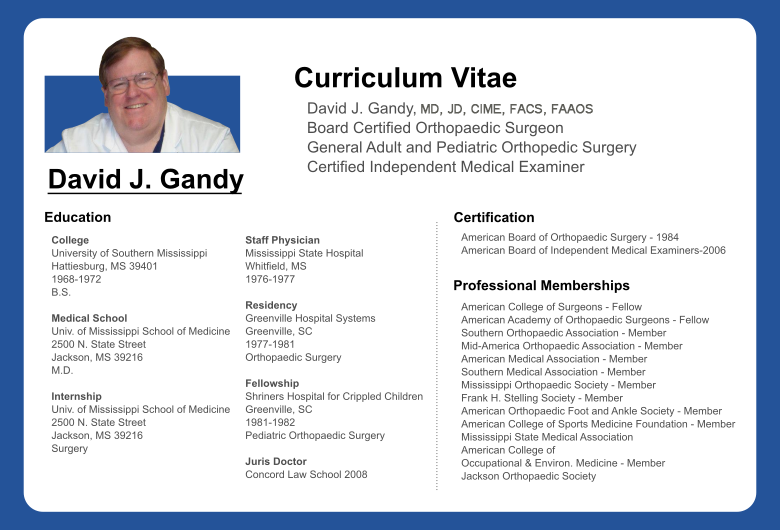 David J. Gandy is a board certified orthopaedic surgeon actively practicing general and pediatric orthopaedic surgery for over 30 years, a graduate of USM and UMC, a Fellow of the American College of Surgeons, Fellow American Academy of Orthopaedic Surgeons, Certified Independent Medical Examiner. In Workers’ Compensation cases, he works closely with patients, physicians, employers, case managers, and insurance carriers in managing those cases.